For the first time in 20 years, there are no English teams in any European quarter final. 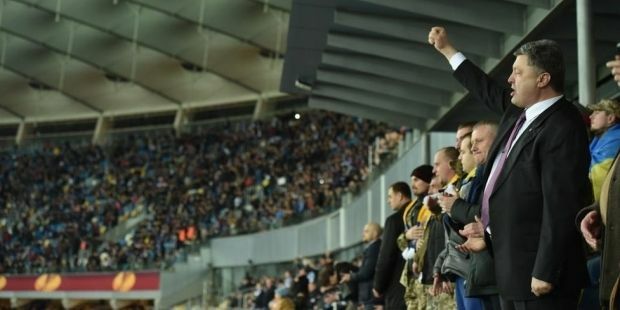 The football match between Dynamo Kyiv and Everton in the UEFA Europa League round of 16, which was hosted by Kyiv's Olimpiyskiy Stadium on Thursday night and attended by Ukrainian President Petro Poroshenko, was over with the Kyiv team's victory. Poroshenko was accompanied by 20 soldiers from the Donbas anti-terrorist operation, who are now undergoing rehabilitation in Kyiv's military hospital. The game was also attended by former Ukrainian presidents Leonid Kravchuk and Leonid Kuchma. The home team scorers were Andriy Yarmolenko (21'), Lukasz Teodorczyk (35'), Miguel Veloso (37'), Oleg Gusev (56'), and Vitorino Antunes (76'). The away team scorers were Romelu Lukaku (29') and Phil Jagielka (82'). The first game in Liverpool ended with Everton's victory 2-1, yet, they exited the competition 6-4 on aggregate. Everton's bitter defeat means that for the first time since 1992/93 there will be no English team among the last eight in any UEFA club competition.